On 05/24/2017 Danielle Renea Thompson attended a court hearing at O.C. Superior Court. After the hearing Thompson walked out of court with her caregiver and fled east on Civic Center Drive toward Ross Street. Thompson has been a victim of human trafficking, she is known to frequent the Harbor Blvd. corridor in Orange County and also frequents Figueroa Street in Los Angeles County. 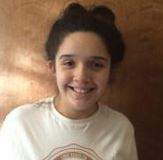 Description: Female, Hispanic, 5’06”, 150 lbs., long brown hair, brown eyes, last seen wearing a white top,blue and white skirt and black sandals. Location last seen: Orange County Superior Court (700 W. Civic Center Drive, Santa Ana).